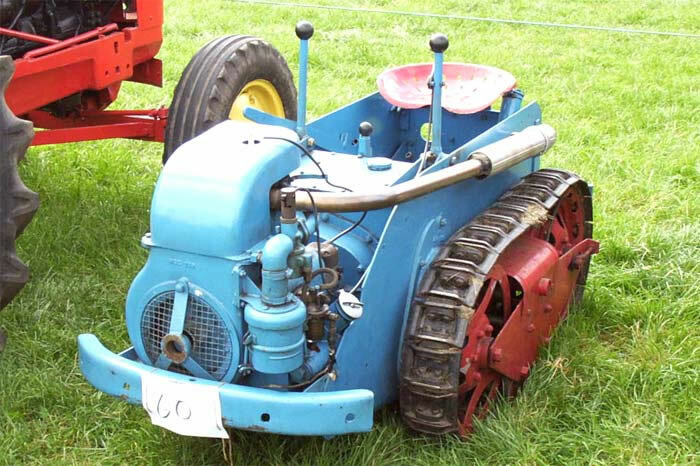 Ransomes MG (Market Garden) Crawler Tractors first appeared when the MG 2 was introduced in 1936 and was produced in various forms for the next thirty or so years. The MG 2 was powered by a 6 h.p. Sturmey Archer air-cooled, single cylinder side valve dry sump engine. Lubricating oil was stored in a separate tank and was pumped to the bearings, a second pump returned it to the tank via a filter. Power was supplied via a 4 to 1 reduction gear from the engine output shaft to a centrifugal clutch which provided drive to a forward and reverse speed gearbox. Top speed was 2 m.p.h. in either direction. Directional control was by two hand levers.